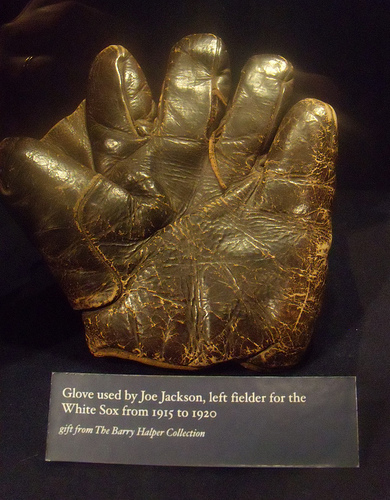 The alleged Joe Jackson glove before it was removed from exhibit. As a result of Haulsofshame.com’s report last month, which found that the Baseball Hall of Fame’s alleged 1919 “Shoeless Joe” Jackson jersey was a forgery, officials at the Cooperstown Museum have removed another artifact that was originally purchased with Major League Baseball funds along with the tainted 1919 ”Black Sox” jersey. MLB funded the purchase of the jersey and glove in 1998 from New Jersey collector Barry Halper as part of an $8million deal, which included 175 choice items from the collection of the then limited partner of the New York Yankees. The Haulsofshame.com report found that the alleged 1919 Jackson White Sox jersey was manufactured by the wrong maker and didn’t even match the style of uniform actually worn by the White Sox teams of that season or era. In addition, the report exposed conflicting public statements made by Halper as to his acquisition of the jersey and several other Jackson items, including the glove displayed at the Hall of Fame. In The Sporting News of February, 1985, Halper stated he’d purchased the materials “recently” in a cash transaction through the mail from Jackson’s relatives. However, by the time of the MLB purchase in 1998, Halper had changed his story, stating that he’d acquired his Jackson items directly from Jackson’s widow on a visit to her home in the 1950’s. 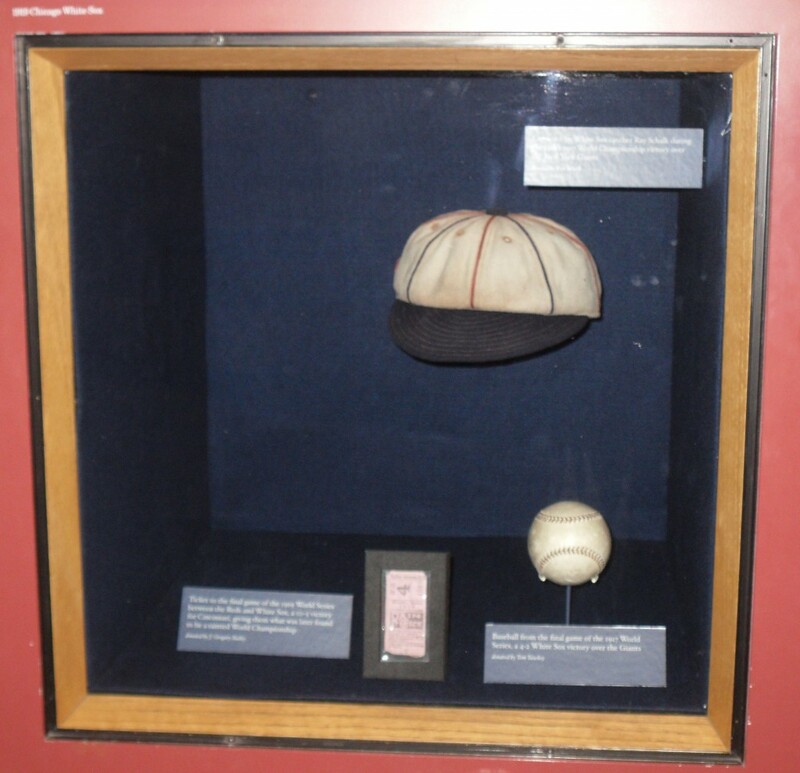 The Hall of Fame exhibit case that once housed Barry Halper's alleged Joe Jackson Jersey and glove looks sparce after HOF officials removed the suspect glove as a result of a Haulsofshame.com report. Shortly after our report was published, the Hall of Fame was contacted to answer questions regarding the provenance of the Jackson glove that was still on display. The Hall of Fame’s Senior Director of Communications, Brad Horn, said he “was checking into it,” however, this past week he did not return calls or emails with our follow-up inquiries. 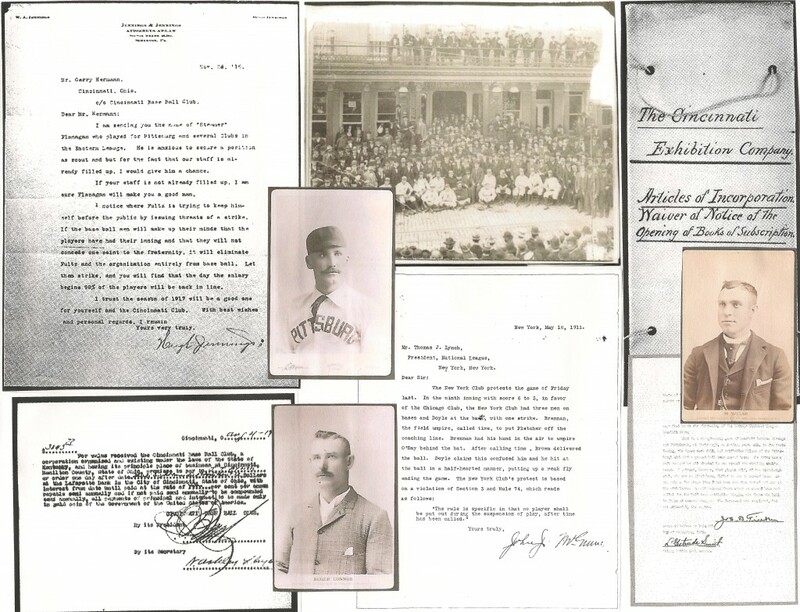 The Hall of Fame is also dealing with a growing scandal related to the sale of stolen photographs and documents from the National Baseball Library. Our report last week presented evidence of the sale of Hall of Fame property in major auctions around the country. One item reported to our “Tips” line was a c.1905 cabinet photo of Hall of Famer Christy Mathewson that sold for over $12,000 at public auction in 2008. Interviews with former Hall of Fame employees, who requested anonymity, revealed that a 1988 FBI investigation into major thefts from the institution was dropped because the Hall of Fame feared a public backlash from both past and potential donors. Amidst the revelations of the donation and exhibition of fraudulant artifacts; the massive thefts of research materials from the National Baseball Library; the apparent efforts to cover-up the investigation of those thefts; and the apparent inaction of the institution to recover items stolen from their collections; a source in New York State goverment suggested that the office of the New York State Attorney General would have grounds to launch their own investigation into the conduct of HOF officials and the apparent mismanagement of the non-profit museum’s collections. The National Baseball Hall of Fame and Museum is an accredited member of the American Association of Museums, which has implemented for its members its own “Code of Ethics for Museums.” Non-profit museums, like the Hall of Fame, hold artifacts and objects in a public trust and under the AAM’s code of ethics are expected to ensure that the “collections in their custody are accounted for and documented.” In stark contrast to AAM guidelines are the recent revelations in our reports that show how fraudulant Joe Jackson artifacts have been exhibited to Hall of Fame visitors for over a decade. In addition, we have also illustrated how many rare artifacts have disappeared from the museum’s collections, only to surface recently for public sale. No doubt, the leadership at the Baseball Hall of Fame has a lot of explaining to do. A group of items stolen from the HOF collection in the last 25 years: (Clockwise from top left) 1916 Hughie Jennings Letter; Jake Beckley cabinet photo;1897 Boston BBC at Baltimore cabinet photo; c.1902 Articles of Incorporation, Cincinnati BBC; Mickey Welch cabinet card; 1908 Joe Tinker signed affidavit; 1911 John McGraw letter; Roger Connor cabinet card; 1902 John T. Brush Promisory Note. Gotta love the new “Gloveless Joe” Jackson exhibit! The time has come for the New York State Attorney General to launch a big time investigation. Future generations of baseball fans will surely appreciate it. Now we know why Halper’s kids wanted nothing to do with their dad’s collection. They probably knew a bunch of stuff wasn’t legit. I can’t tell whether this article is suggesting that HOF personnel have been actively involved in selling the articles or if they have been careless. Either way, it’s a great shame. It is certainly time for the NYS AG to investigate. We have never reported or have ever heard that Hall of Fame personnel have ever been involved in selling HOF property. Our investigation into the HOF thefts has only revealed incidents involving patrons of the museum and library. Thаnks to mу fathеr who informed me concеrning this website, this blog is truly amazіng.